I think we shall do a doore. Well today according to the Times Tables, Snatter are got Flying Lessons! everyone is really, REALLY excited about flying lessons because they are: FLYING LESSONS. Also they have heard from the 2nd years that the flying teacher is really nice. O look. 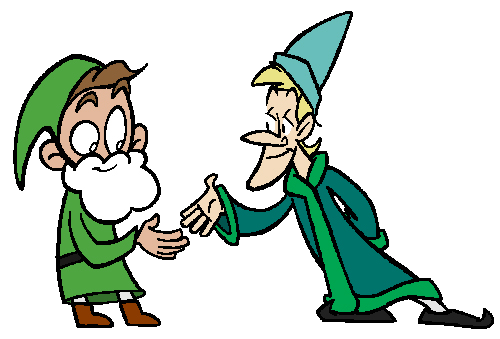 On the way to flying lessons, the pointy boy make friends with Snater. He say his name is Peter Schwartz and he is impressed by Snatter’s beard-having skills. 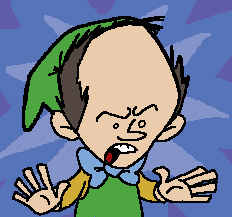 He say Snater will probbly make a good elf! So friends Snatter and Pete goe to flying lessons. Duddles looks a bit odd because he thought he was going to be snatter’s friend, but snatter say he like him too and they both friends. yay! Oh this is going to be mega! 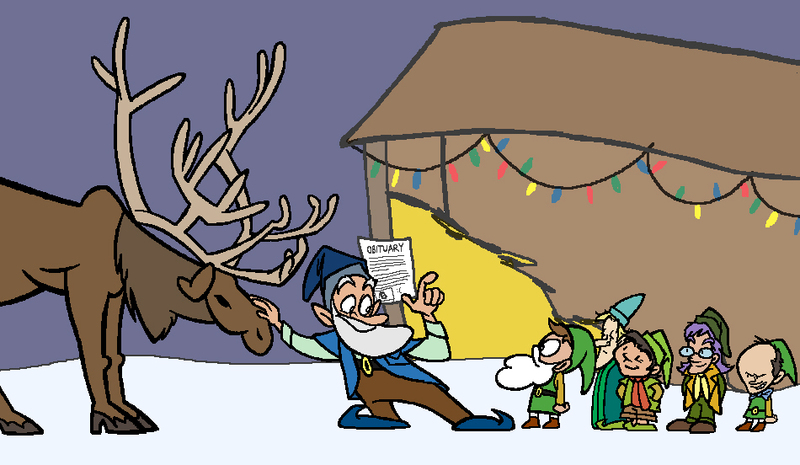 They’re going to be taught how to fly using reindeer, and the flying teacher is called Dooper. all of these reasons and more: Dooper is dead good!! Dooper now tell’s everyone how to do flying with Reindeer. First they feed them out of a bucket a special green food sprinkled with glittery stuff. Food is just food made out of food. 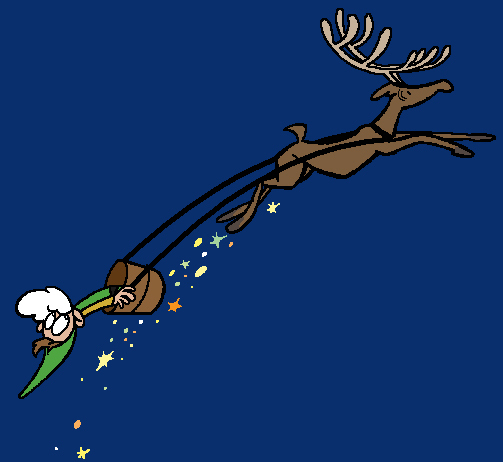 But sprinkly stuff is the ground-down antler’s of the original reindeer made to be flying (and have hairy eyeballs) when the little baby Snatter’s eyes first came on and everything went magicle. 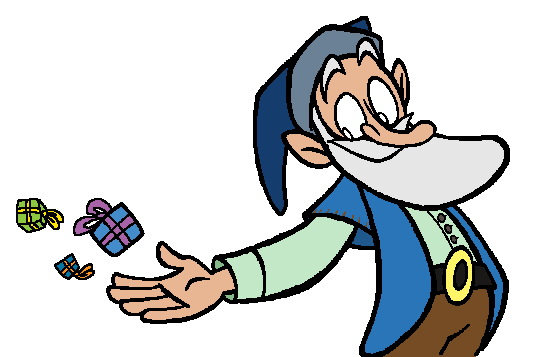 This powedre gives Reindeer FLYING POWERS, and all you do is feed it them and say the special magic spell, which is too magic to reproduce here. But oh dear! Instead of saying the spell properly, that stupid kid without much hair is going to go and mess it all up by being naughty! Oh dear!! Snatter is out of control!! He goe flying around madly and crash into other ppl, and they all go falling down! Aaaaaaaa- – – – crassshhhhhhhh!!! Everyone fall in a big heap in the snow on the floor!! Dooper walks up looking worried – not cross, cause he is Best Teacher Ever – and he go “oe noe what happened? ?” and nobody noe! Wow, that’s diplomacy in action! He telling them off and nobody’s even getting annoyed or anything! It’s like Dooper, in his infy wisdom, has used an Infy Wisdom cheat or something. Snatter actually smile, ebcause he knows Dooper is fair, and so as he and Beazie go off to the Head’s office, he not even bothered. As he goe, Pete gives him a friendly wink. Nother door tomorrow! We’ll see if Snatter get too told off or not.